Thursday afternoon saw the largest pro-Putin rally yet this protest season, the latest in a series of rival demonstrations that have gripped the country since the parliamentary elections last December. But as thousands descended upon a Moscow arena, the nature of the crowd reminded many that while Prime Minister Vladimir Putin has lost the trust of the urban intelligentsia, his support base in far-flung ethnic regions – and among the typically loyalist class of bureaucrats and civil servants – remains largely intact. As the masses flocked to the Luzhniki Stadium outside central Moscow – their number, once gathered inside, was estimated at around 100,000 – the atmosphere was festive. The area around the arena boasted food stands hawking grilled meat, baked goods and, in honor of the annual Maslenitsa festival week, pancakes. The occasion was also marked by the celebration of the Day of Defenders of the Motherland, a national holiday that heralds the contributions made by generations of Russian and Soviet men to national security. And the “Russianness” of the event was readily apparent. Outside, performance groups in traditional Russian costumes entertained passersby with folk songs, while members of the Central Cossack Host, adorned with handlebar moustaches and dressed in their own traditional uniforms, wandered by as recordings of traditional Russian (and some Soviet) songs blared from the stadium’s loudspeakers. But many of the participants betrayed the ostensibly national character of the rally. 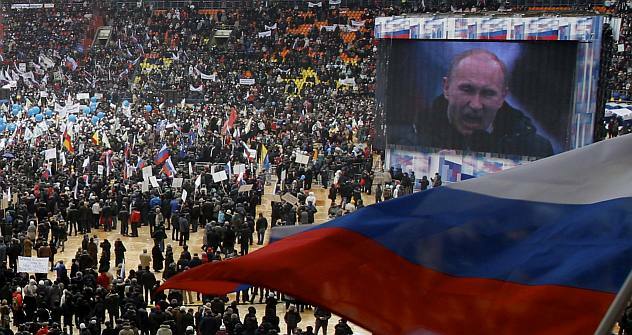 Mixed in with the sea of Russian flags and other patriotic symbols were flags from faraway ethnic regions, suggesting that Putin’s support base, while quickly eroding in Moscow and other urban centers, is alive and well elsewhere. Among the ethno-national hodgepodge were representatives from Siberian regions and Caucasian republics – perhaps in curious conflict with the young Russians touting old imperial flags and the Cossacks meandering about in their tunics. But some participants’ apparent commitment to the cause stands in stark contrast to the multitude of media reports in recent weeks, especially on the heels of the previous pro-Putin rally on February 4, claiming that many had been either forced to attend such rallies or had been heavily incentivized to go. From travel stipends and free vodka to open coercion from superiors, a variety of methods were reportedly employed to feign a strong showing for the embattled Putin regime. What’s more, many seemed to belong to the classes that have long been the most devout Putin loyalists: civil servants, public employees and low-level bureaucrats. Traversing in packs throughout the crowd, their symbols were openly visible – from the Union of Machine Builders and the Union of Educators of Moscow to Ingush parliamentarians and Siberian public workers, each waved their flags, sometimes unenthusiastically, as curious onlookers passed by.